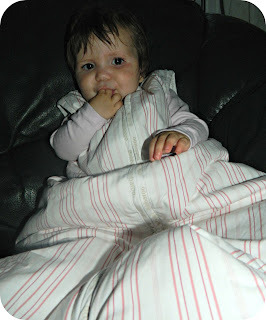 We're big fans of the baby sleeping bag in our house and, as both of my babies were above the minimum weight to wear one, they have been wearing them since just after their births. 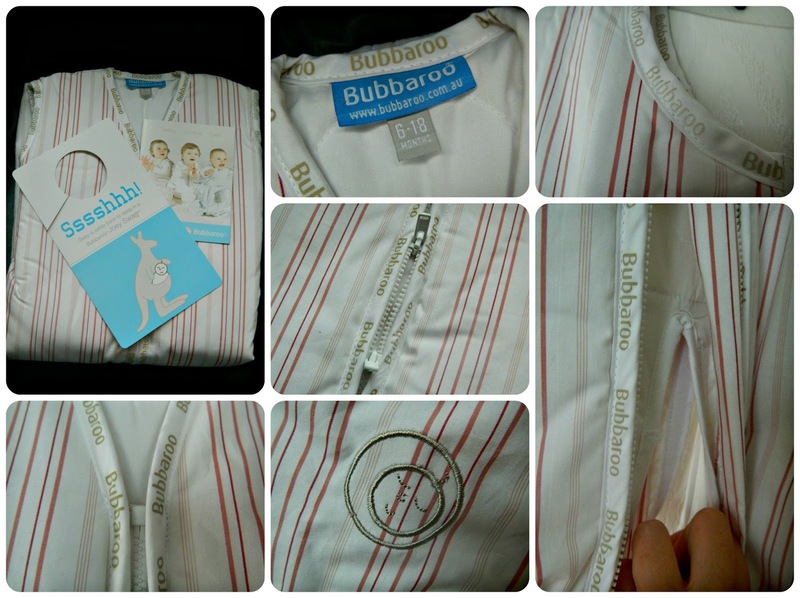 When Little Miss and I were offered the opportunity to review a Joey Swag from the new to the UK, Australian brand Bubbaroo, we were so pleased. Unfortunately the Joey Swag's arrival coincided with a prolonged period of what I've been led to believe is called 'Summer' so it was a while before we were able to use it. The Joey Swag is available in either Colour (Delicate Pink, Mystic Blue, Mocha and White with Stone Binding) or Stripe (Cherry Stripe or Denim Stripe). Little Miss received the Cherry Stripe Joey Sway which features deep pink stripes on a white background, with Bubbaroo branding on the binding tape around the edges. Very elegant and stylish with no 'cute' characters to be seen! There are four weights of Joey Swag available - Lightweight, Mediumweight, Heavyweight and Extra Heavyweight. Each sleeping bag is supplied with a handy hanging guide to place in your babies room which tells you how to dress your baby in each weight of sleeping bag for each temperature. Our sleeping bag is heavyweight but it's refreshing to see that the sleeping bag doesn't actually feel very heavy at all. The bamboo fabric construction means that your baby feels warm and snuggly without feeling like they are wearing a duvet! They are available in three sizes - 0-6 months, 6-18 months and 18-36 months. We received the 6-18 months Joey Swag which has plenty of growing room for Little Miss, it will fit her for a long time to come. I've examined the Joey Swag really carefully and I'm really impressed by the quality of the construction, there aren't any uncomfortable seams or corners to impede upon the quality of your child's sleep at all. The fabric feels beautifully soft and the sleeping bag has washed brilliantly. I've now washed and dried it twice and it really is as good as new. The advice is to keep the zips closed during washing and I think this means that the sleeping bag retains it's shape well. So what does Little Miss think? Well, we stopped using sleeping bags with her for a while as she was having really restless nights. She moves around an awful lot in her sleep and I think the sleeping bags were causing her to feel uncomfortable. Since we received the Joey Swag and her room temperature dropped enough for her to use it, we have had no problems with her wearing it downstairs when she gets ready for bed. However, when she gets to bed she cries and makes it clear that she doesn't want to wear the sleeping bag. This is no criticism of the Joey Swag, I simply have a little girl who is very stubborn and knows her own mind. I'm hoping that, by encouraging her to wear it while she is awake, or for daytime naps, I can get her wearing a sleeping bag to bed again as I much prefer her to be in one, for safe sleeping reasons and because I know she can't kick it off and be lying in the cold. This is a really high quality sleeping bag, soft, comfortable, easy to use and with the added convenience of being able to feed car seat or pram harnesses through it for the easy transfer of a sleeping baby. I always think that sleeping bags are an excellent gift for a new baby and the lovely presentation of the Joey Swag really reinforces that.